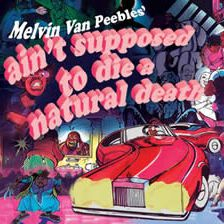 Ain't Supposed to Die a Natural Death is a narrative about the comings-and-goings of a poor Black neighborhood and explores every aspect of the ghetto existence. It is a pointillist portrait of a community using no drama save its residents’ daily lives, no antagonist save a general malaise called "the man." In a series of musical monologues, the junkies, whores, pimps, lesbians, drag queens, sweating workers, crooked cops, prisoners, lovers, and dreamers sing their fears, frustrations, criminations, recriminations, and regrets - all blending together into a unified cry of pain.